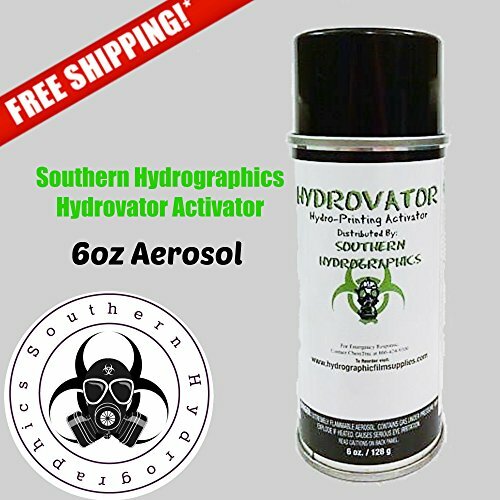 HYDROGRAPHIC / WATER TRANSFER FILM ACTIVATOR This listing is for One 6 oz Aerosol Container That will cover approximately 1 Meter of Hydrographic Film You will get good even spray that covers perfectly and never clogs, every single time. If you are a seasoned dipper, you already know the importance of a good activator. If you're new to hydrographics, you will quickly learn that Film Activator is a key difference from good dip's and bad This Activator will insure a successful dip. Ideal for most films on the market. Formulated perfectly to provide a vibrant image and liquifies in just one pass. CAN SHIP IN U.S. LOWER 48 ONLY. Your order will be shipped surface only to lower 48. Our aerosols are packaged and shipped separate from your film orders. If you order film and activator you will receive the activator separate. We package our film in compliance to UN1950 2.1 DOT requirements and at the guidance of our local post office. The Aerosol is shipped without the discharge valve attached to protect discharge during shipment. the can is packaged securely with absorbent material around the package. If you order more than 2 we will separate your cans into multiple shipments. or ship via UPS. THANK YOU FOR YOUR PURCHASE Water Transfer Printing or "Hydrographics" is the latest technology in the custom coatings industry. This easy dipping process is used to apply vivid, high definition graphics to virtually any material. We have hundreds of patterns to choose from such as: Camo, Carbon Fiber, Wood Grain, Skulls, Flames, Animal Prints, Abstract Designs, Marbles, Stones, Metals, & More! The applications are endless: Automotive, Motorcycle, Marine, Sporting Goods, Electronics, Hunting Equipment, Firearms, Housing Decor, You Name It! We are the industry leader for Hydrographics Equipment, Materials, Training, & Tech Support. Contact us for more info.